Anchor's second Transylvania, sister of Caledonia IV, was built by Fairfield Shipbuilding & Engineering at Govan. She was laid down in 1919, but soon after work stopped for nearly two years. As a result, her launch occurred in March 1925, followed by a Glasgow-New York maiden voyage on 12 September 1925. In November 1928, assisted by the East Asiatic Co.'s Estonia, Transylvania rescued 13 of the 26 members of the crew of the sinking German freighter Herrenwijk. Months later, in March 1929, Transylvania herself was damaged and out of service for more than two months after she grounded on La Coque Rocks, near Cherbourg. During the late 1930's. 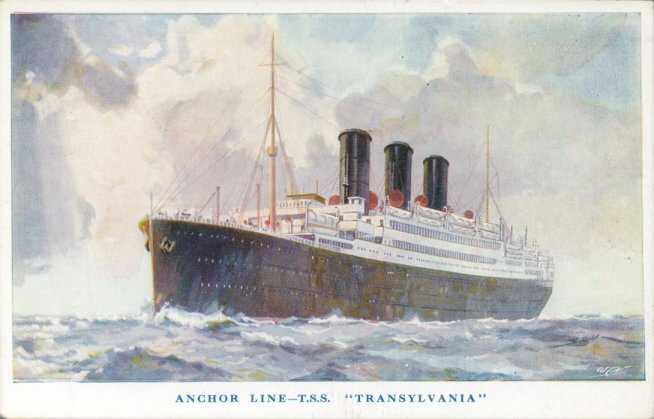 Transylvania engaged in West Indies cruising in addition to her regular North Atlantic service. Requisitioned as an armed merchant cruiser when World War II began, she was torpedoed and sunk by U 56 west of Inishtrahull on 10 August 1940. Although nearby trawlers were able to rescue about 300 of Transylvania's crew, there were 48 fatalities. Sources: Bonsor's North Atlantic Seaway; Haws' Merchant Fleets; Kludas' Great Passenger Ships of the World; Williams' Wartime Disasters at Sea.